Being a high school athlete can be difficult. Between two-hour practices three to four times a week and home/away games, let’s face it—it’s sometimes hard to juggle everything and be at your best all the time. Unless you are the greatest athlete to come out of your generation, odds are, you need good grades and a good GPA to not only stay on your high school team, but get into a college program. What happens, though, when you live in a semi-underprivileged area and you have even more odds stacked against you in both the education and athletics areas? Enter: Boston Scholar Athletes. Relatively new, BSA was founded in 2009 as a result of a conversation between Boston Mayor Tom Menino and Suffolk Construction CEO and Chairman/BSA Founder, John Fish—two people who have proven to be passionate about Boston youth. After looking over the unfortunate state of Boston Public Schools’ athletics programs, they both decided that something needed to be done; they were looking to capitalize on their joint sentiments that athletics help promote academic excellence. In a Boston Globe article printed last April, Menino was quoted as saying, “. . . he [Fish] said ‘I’m going to make sure we have a program in Boston that works both scholastically and athletically for the young people in our city.” After only three and a half years, the BSA program is now implemented in 19 Boston Public Schools and enrollment is rising year after year—not to mention grades, GPAs, and college acceptance rates! 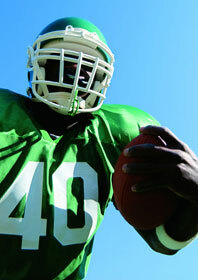 If you love being an athlete, odds are you need to do well in school to stay on the team. If you put two and two together, you create a positive result: athletes need school to play their sport; thus, academics are the key to any type of athletic success. The main component of BSA is called the ”Zone;” it’s essentially a learning center for athletes to visit where they can meet with tutors, work on homework, and prepare for college with admission help. There is a Zone in each school comprised of laptops, text books, graphing calculators, and other top-of-the line academic equipment that are all free to use—luxuries that most Boston students do not have available at home. Boston’s news magazine, Chronicle, recently aired a segment on BSA. While I can praise these learning centers up and down in this blog, sometimes a visual is worth more than a thousand words. Chronicle can take you inside the Zone for a first-hand look at its students and tutors in action. As someone who grew up in Massachusetts, and someone who has consistently heard and seen the troubles of the Boston Public School system, I know what an achievement those figures mean to the city. What the BSA is doing is truly changing lives. It is giving confidence back to students who did not think they could do better than a 1.0 GPA, and it is telling students that they can go to college and succeed as a student athlete—achieving dreams that I’m sure were almost unattainable for some just a few years ago. Do you have a similar program in your town, city, or state? How has it affected student athletes? Let us know in the comments below!